What does it mean for human beings to flourish? The word flourish means: to grow or develop in a healthy or vigorous way, especially as the result of the perfect environment - i.e. wild plants flourish at the banks of a river. So what is the perfect environment - the perfect factors required for human flourishing? People may say... good education, financial freedom, freedom to choose, a democratic government, stable home, loving parents, a good therapist. With the intention of creating the best space for human flourishing, ideas, articles, books - entire governments and counsels have been created to implement, and establish environments of human flourishing. However what we see in the context of our world and history is a constant struggle to find and achieve the perfect environment/conditions for humans to flourish. And as we look through history, each generation has environments and conditions they believe best allow that flourishing to occur which another generation soon will call 'outdated,' and in some cases 'oppressive.' 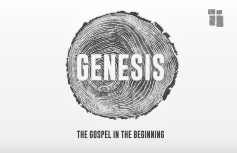 What we see within the first chapters of the book of Genesis is a pattern for an environment, a habitat, a world where humanity truly flourishes the way it was intended to flourish. But sadly we also see the rejection and arrogance to think that we as humans have the ability to self-determine and redesign that flourishing. In our Genesis series (beginning 15 January) my hope is that we see the wonderful pattern of flourishing God gives, despite our rebellion and rejection of Him. It is my prayer that we see His graciousness in His promise to restore that perfect environment, habitat, home, world, rest, and relationship through the work of His Son, Jesus.